Medical Acupuncture (or Dry Needling) is an effective and efficient modern treatment designed to ease muscular pain and myofascial dysfunction. It is a more recent form of Acupuncture which is very effective for relaxing overactive muscles, which contain trigger points. Medical Acupuncture is based on Western anatomical and neurophysiological principles and should not to be confused with the Traditional Chinese Medicine form of Acupuncture whose principle is based on the body’s energy flow (Chi). 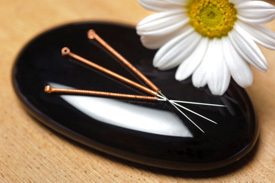 When performing Medical Acupuncture, a practitioner inserts several filiform needles (short, stainless steel needles) into your skin and “trigger points” in your muscle or tissue. The needles will remain in your skin only for a short period of time (minutes). The most common question we get is about the needles we use and if the treatment hurt… Most people have encountered hypodermic needles and sewing needles. Both types are gigantic compared to the ones we use. In fact, five of our needles could easily fit inside a hypodermic needle! When we first insert these ultra-fine, sterile needles, most people report an only small prick, like a mosquito bite. 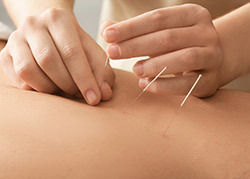 The main benefit of Medical Acupuncture is the relief from muscular pain and stiffness. Additionally, by dissolving trigger points the flexibility of a muscle is improved and general range of motion increased. In our experience, Medical Acupuncture is a great adjunct to Chiropractic Care and other physical therapies and is very useful in the treatment and management of: sports injuries, muscle pain, fibromyalgia pain, back pain, neck pain, shoulder pain, sciatica, headaches and arthritis. Mild side effects such as mild bruising, bleeding and temporary soreness are possible, but serious side effects are very rare.